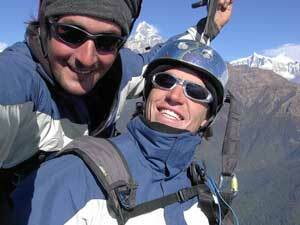 Join us in Pokara for exceptional flights over the himalayan mountains. Discovery tandem flight - 25-30 mn. Expedition tandem flight - Several hours. 2 days fly and landing in the moutain sleep in remote village and fly back . see with our pilot . From Sarangkot (1500m) to Pokhara (800m), a first flight experience. Feel the sensation of flying in thermal conditions, (rising more than 500 m from the take-off point), from there we fly cross-country with the birds, over the local countryside you will see the rice fields, traditional villages and the people working in the fields, before we fly over the lake, offering the chance to do a little acrobatic flying (if you want to! ), before landing beside the lakesid. Flights last from 20 minutes to 30 minutes, depending on weather conditions, and you ! Cross-country flight is for those people who want to experience more about paragliding - to fly into unchartered territory, with only the birds and the wind for company. Cross country flight is recommended for people who have already flown a tandem flight! We take off from Sarangkot (1500m) and dependant upon the weather conditions we can cross the lake, or many of the other unspoiled valleys in the area, following the Seti, or perhaps the Mardi River, reaching altitudes of between 2500m and 3400m before returning to Pokhara by air, or perhaps by bus or taxi!! Nearly an expedition!!! We leave early in the morning by bus or taxi, between 1 and 3 hours of Pokhara to fly over the real Nepal, and try to come back to Pokara by flight. Or we go from Pokara by fly to sleep in the moutain and come back the next days by fly . If you want to enjoy the latest accro figures this is the one for you! Adrenaline and fun!